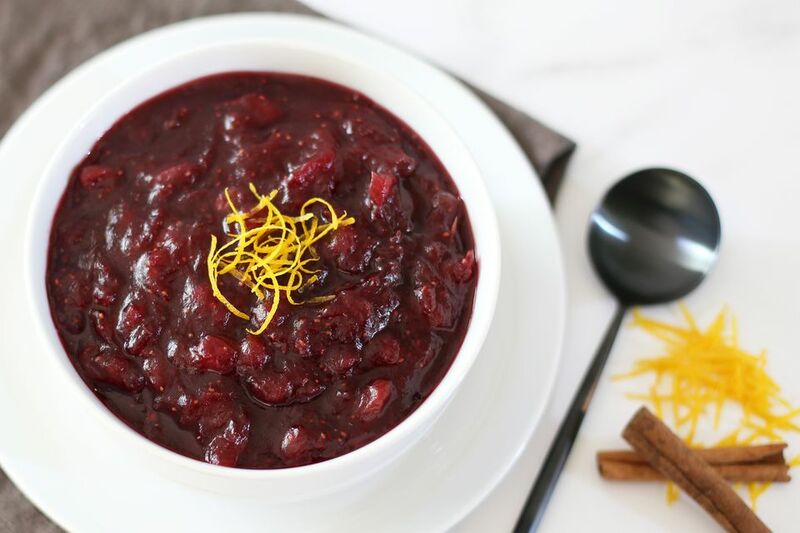 This Instant Pot cranberry sauce makes an essential Thanksgiving side dish a breeze to prepare and cook. The sweet-tart ruby red sauce complements a turkey, chicken, or ham dinner with its flavor and vibrant color. It's excellent to serve with the leftovers as well—add it to a sliced turkey sandwich or serve the sauce alongside a turkey and dressing casserole. The pressure cooker makes preparation nearly effortless and it leaves the oven and stovetop free for other dishes. Cranberry sauce isn't just great for the big Thanksgiving feast or Christmas dinner. Aside from being a tasty stand-alone condiment, whole berry cranberry sauce adds flavor and texture to all kinds of dishes, from an apple cranberry pie and appetizer meatballs to gelatin salad and this festive Greek yogurt (labneh) dip. Add cranberry sauce to plain yogurt or cream cheese or use it to top biscuits, pancakes, or cheesecake. The cranberry season is fairly short; harvest begins in September and continues into November. Use frozen whole cranberries in this recipe if fresh berries aren't available. When fresh cranberries are available, stock up on them and store the bags in the freezer to use throughout the year. Whole fresh cranberries and homemade sauce freeze beautifully! Rinse the cranberries and pick them over, discarding any mushy or damaged berries. Add the cranberries to the Instant Pot. Zest the oranges and then juice them. You should have about 1/2 cup of juice. Add the finely grated orange zest, orange juice, sugar, maple syrup, vanilla extract, and the cinnamon stick to the pot with the cranberries. Gently stir to combine the ingredients. Lock the Instant Pot lid in place and set the vent to sealing. Choose the manual setting, high pressure, for 2 minutes. Let the pressure release naturally for 10 minutes, and then move the vent to release the remaining pressure. Set the pot on saute and cook for another 2 to 3 minutes, stirring frequently, until thickened. The sauce will also thicken more as it cools. Transfer the cranberry sauce to a storage container and cool completely. Refrigerate until serving time. Serve it chilled or at room temperature. Spoon the cranberry sauce into a serving bowl and top with shreds of orange peel, if desired. The Instant Pot ​cooking time of 2 minutes does not include the time it takes to build and release pressure. It will take approximately 15 minutes to bring the pot to high pressure, and you will need to add about 10 minutes for natural release of the pressure. Refrigerate leftover cranberry sauce in covered containers for up to 10 days. Or freeze the sauce in airtight containers or freezer bags for 1 to 2 months. For additional flavor and texture, add a finely diced apple or pear. Cranberries are tart and need a generous amount of sugar. If, after releasing the pressure, you find the sauce is still too tart for your taste, add more sugar and continue cooking on the saute setting until the sauce reaches the desired thickness and the sugar has dissolved. For a thinner sauce, warm it in a saucepan over low heat and add small amounts of water or juice until the desired consistency is reached.